There were two alternatives for dealing with the short sight for the trip. I chickened out of the laser eye surgery after reading Joe Simpsons account of the procedure. If a man who has crawled out of a crevasse with a broken leg describes it as painful, then it probably is. I have a backup pair of specs that are reactor light, so although they appear highly unfashionable, they can be sunglasses as well as spares. I also have a few boxes of daily disposable contact lenses for really grim weather days. I can afford to use one pair every two or three weeks over the autumn. I am experimenting with using the same pair two days running and putting them in boiled water with a pinch of salt in for the night. Despite using lenses on and off for years, I still need a mirror, which until now Mark has had to patiently hold up as I struggle, swear and generally poke myself in the eyes. 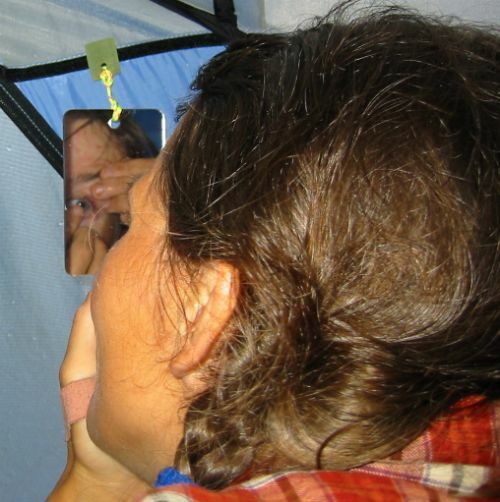 Last year I found a plastic mirror and now have it on a bit of Velcro, so I can hang it up in the tent, leaving Mark free to attend to his own concerns in the morning.